It’s no secret that Indiana is an amazing place to hike and explore nature. Whether you’re trekking the rolling hills of Brown County State Park, swimming in Lake Michigan at the Indiana Dunes, or taking a bike ride through Eagle Creek State Park, there’s something to enjoy for anyone who loves being out in the wild. But while it’s easy to get lost in the wonder and beauty of Indiana’s forests and parks, it’s also easy to forget our state is home to a few plants that can be dangerous—even deadly—to humans. To help keep you safe, we have a few pointers on how to recognize and stay away from some of these potentially harmful plants. Poison ivy. 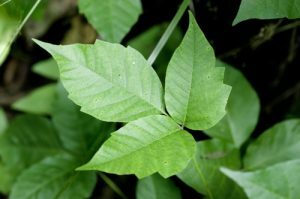 As one of the most rampant poisonous plants in Indiana, poison ivy can be found just about everywhere. Since roughly 85% of the population is allergic to it—with 10-15% of people being extremely allergic—it should be avoided at all costs. Luckily, poison ivy is easy to spot. It’s a vine that tends to grow close to the ground but can also be found climbing fences and trees. You can identify it by looking for dark green, typically glossy leaves in groups of three, with a red center on the stem between them. During fall, the leaves themselves will start to turn red. Since just brushing the leaves with your skin can cause a reaction, it’s easy to contract a poison ivy rash without even knowing it. The rash can appear in just a few hours after contact or up to two days later, so if you think you’ve touched the plant, thoroughly wash the affected area with soap and water. If a significant rash appears, it’s always a good idea to speak with your doctor. Stinging nettle. If you’ve never experienced the pain from a stinging nettle, consider yourself lucky: It’s a sharp, itching, burning sensation that will stop you in your tracks. It stings when you touch the small hairs on its stems and leaves, which act as miniature hypodermic needles that irritate your skin with several chemicals, including histamine. Unfortunately, stinging nettle is all over the place in Indiana. It tends to favor spots with moisture, including along riverbeds and in dense forests, but they’re hearty plants that can also grow in open fields. You can identify a stinging nettle by looking for leaves with jagged edges and pointed tips, and by closely examining the leaves and stems for fine, almost translucent hairs. They often grow in bunches, and range anywhere from one to six feet tall. 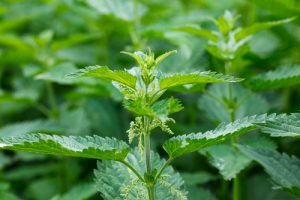 Stinging nettle can cause a lot of pain, but fortunately, this rarely translates to serious, long-term issues. And believe it or not, some people actually cook and eat stinging nettle, which—if prepared properly—will lose its stinging sensation and is quite nutritious. But we don’t recommend eating it unless you know exactly what you’re doing! Angel’s trumpet. The angel’s trumpet is a stunning flowering plant that’s native to South and Central America, but is now spreading across the USA, including Indiana. It’s just as deadly as it is beautiful, and it’s one of the most toxic plants to humans and animals in the world. But because of its attractive flowers, angel’s trumpet is becoming a more popular fixture in Indiana gardens. The good news is that angel’s trumpet is only deadly when ingested—however, every part of the plant is highly toxic. 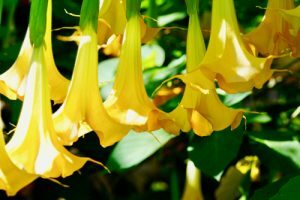 The effects of angel’s trumpet poisoning are dramatic, and include hallucinations, muscle paralysis, confusion, and, in extreme cases, cardiac arrest. Identifying angel’s trumpet isn’t hard: It’s a large shrub with many branches and can grow up to 30 feet long. The plant gets its name from the huge, droopy flowers in the shape of a trumpet horn. Flowers come in many colors, including red, white, orange, and yellow, and emit a distinct scent that many people enjoy. Smelling the flowers is okay, but definitely don’t taste! Giant hogweed. 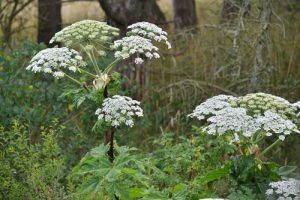 Another invasive species that’s highly toxic to humans is giant hogweed. Its sap is phototoxic, meaning if you touch it your skin will become inflamed by sunlight almost immediately. Much like poison ivy, an exposed area should be washed with soap and water right away, but you should also keep the area covered and away from sunlight. Giant hogweed is—as its name suggests—a huge plant that’s hard to miss. It grows anywhere from five to fifteen feet tall, has small white flowers in big bunches, and has green stems with large red and purple spots. The flowers look quite similar to Queen Anne’s lace, but make no mistake, giant hogweed is far more dangerous. It tends to grow in moderately forested areas where it can get ample sunlight and lots of water. If you think you see one, don’t get close, as its toxic sap can harm your skin even if you just brush up against it. While Indiana is home to some dangerous plants, we hope this doesn’t discourage you from spending time exploring our state’s diverse and verdant natural habitats. As long as you know what to look for, you’ll be prepared for your next hiking trip—and you can tell your friends what to look out for, too. And if you’re looking for a more extensive list of dangerous plants in Indiana, check out the Indiana Poison Center’s plant guide. Our team at Engledow is full of plant experts who are passionate about all things green and growing. If you’re looking to add some beautiful trees, flowers, and shrubs—or landscaping services—to your home or business, contact us today! This entry was posted in Indiana and tagged Featured by Eric Engledow. Bookmark this link.